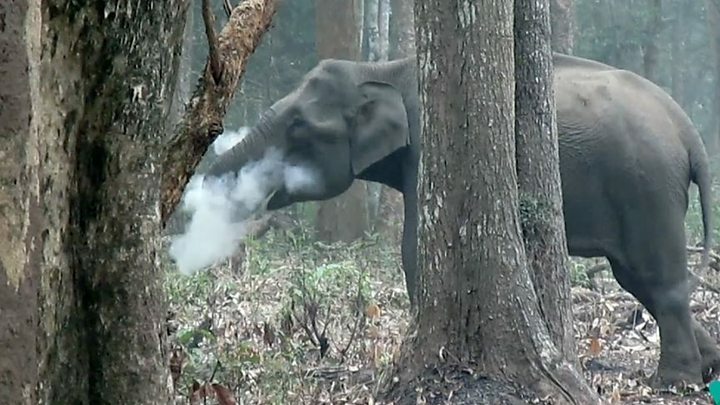 A video of a wild elephant in India blowing out ash from a fire has baffled wildlife experts around the world. He told the BBC that he had not released the video until now because he did not "quite realise its importance". "This is the first known video-documentation of a wild elephant exhibiting such behaviour, and this has scientists and experts puzzled," a statement issued by Wildlife Conservation Society (India) said. The elephant "appears to ingest charcoal" left by a controlled fire on the ground and "blow out the ashes", according to the statement.